No matter what kind of child you have, parenting can be really tough at times. It's exhausting, begs of your best self, and challenges you at each pass. Once you get used to a stage, it changes. Not to mention dealing with the social stratum that is preschool/daycare and eventually the public school system. It's a wild, rewarding ride. For me and my husband, though, parenting seemed to be encompassing a bit more than the above-mentioned, run-of-the-mill parenting trials. It started fairly early on when, as an infant, I noticed that could never put my daughter, The Bird, down. She always needed to be touching me to sleep, and her separation anxiety took on a life of its own. Later, as I looked to some of my more seasoned friends and family for parenting advice, I noticed that despite taking their advice, the techniques just didn't work. Coming into last summer, I felt that I was doing something wrong. The people around me would tell me that I was a good parent, and I knew that I was truly striving to be one, but inside I didn't feel like a good parent. I felt I had fleeting successes, and a lot of frustration. Why, I would ask myself, is everyone else's kid doing what they ask and mine seems incapable? What am I doing wrong? A series of events over the fall found me looking a little bit deeper. Behaviors that people said my daughter would "outgrow" simply weren't going away. I Googled...furiously. I was going to find an answer if it was the last thing I did and that was where I found two words that changed my life: Spirited Child. 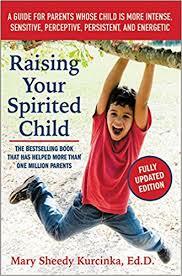 Faster than you could click a mouse, I ordered up "Raising Your Spirited Child" by Mary Sheedy Kurcinka, Ed.D., and thanks to my Amazon Prime membership, it was here in two days. It arrived on a Saturday. By Monday, I felt a seismic shift in my parenting, and in my confidence as not only a parent, but a person. Finally, everything I had experienced up to that point: my parenting failures, my inability to integrate parenting advice from friends successfully, and the how's and why's of my daughter's behavior, all made so much sense. I am not exaggerating when I say that the contents of this book changed my relationship to my child, and my enjoyment level as a parent has gone up exponentially. The book espouses gentle parenting, which is something I am innately drawn to. But in order to put something into practice, you have to have clear techniques and phraseology. This book lays it all out with clear techniques for your child's individual personality traits. For example, my child is a "spirited introvert." For my child, socializing can be quite exhausting, and she needs time to recharge. Changes in routine can be perplexing and disruptive, and so she needs to know when things change, and how it will be different. Spirit is why you can't let your child "cry it out" during a tantrum (it would never. ever. ever. end). It's why the ingrained style of discipline we parents have may not work (these kids respond to very specific techniques). It's why it's extra hard to leave them with anyone--grandmas, schools, babysitters. It's why your child is acting like a complete maniac in the crowd at an outdoor festival, despite her own excitement. It's why they don't sleep like other kids. It's also why your kid loves play doh, the water, and other sensory experiences. Or why they don't. It's why they can lock into something for hours. It's why they are hilarious, and creative. It's a part of who they are. Now I am more familiar with terms like "slow to adapt," and I can anticipate hard moments and try my best to head them off at the pass. I am familiar with WHY I was failing before, and I'm experiencing a lot more success. I am also aware of how much calm it's going to take on my part, and that is a new kind of exhausting. I am parenting harder than ever before, and I have to be really on top of my game. But on the flip side of that, my family is having some of the best times we've had together. We are communicating, disciplining, and loving better. In my mind, I had this vision of being a parent. I want my child to know me for who I am, and I want to bring that truest vision of myself to my child. Before I knew she was spirited (and an introvert), I was spinning my wheels, and I felt bad about my parenting because it was going against who I wanted to be...now, I find that I am being pushed to be a more thoughtful parent, and bring more of who I am at the deepest level to my parenting. It feels really good. Parenting a child with spirit in these early years is a challenge. But I know that I have been given this challenge because I can not only handle it, but I can succeed at it. Spirited children are said to make wonderful teenagers because the qualities that make them a challenge to parent in early life are the same qualities that make the impervious to peer pressure, boast leadership, and create good problem solvers. So that is a major silver lining. If you are parenting a child with spirit, then you've probably been suspecting that something was up. I cannot recommend this book enough. It is life-altering for parents and children alike. This book really validated some of the things I knew in my heart, but couldn't really wrap my head around, like why my daughter doesn't want to kiss or hug people hello. Now, I don't feel bad for a single second telling people (kindly) to give her a little space. I don't feel like I need to keep comparing why my parenting isn't getting me anywhere because now I have techniques that really ARE working for me. They don't look like what my friends do, but for the most part, they get us at the same place. Are you parenting a spirited child? Feel free to discuss in the comment section below!! I have been on a healing health kick this New Year. It's not really a resolution, as I have been pretty homeopathic over the years. I love to make a yearly batch of fire cider (CLICK HERE for recipe), and I have been drinking kombucha for a few months now to heal my gut. 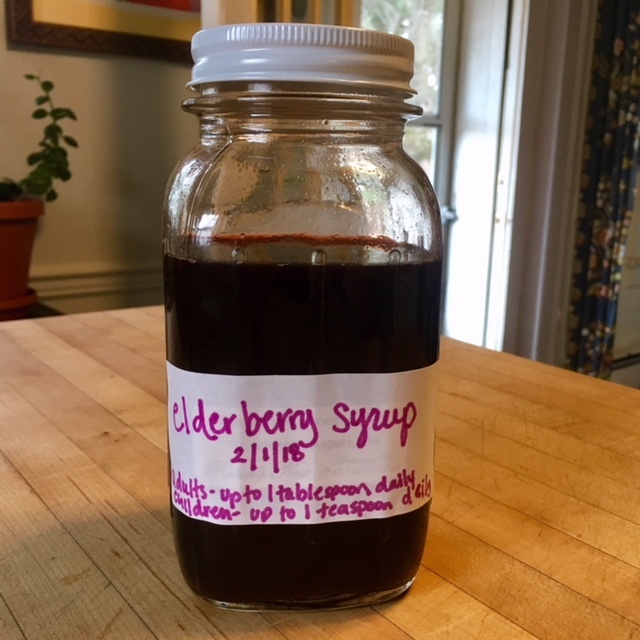 With the flu season in full freaking swing, I figured it was time for me to finally take the leap into making elderberry syrup. Now, you can buy remade syrup in the store, and I'm sure it's great, but it's expensive. And I'm on a tight budget. 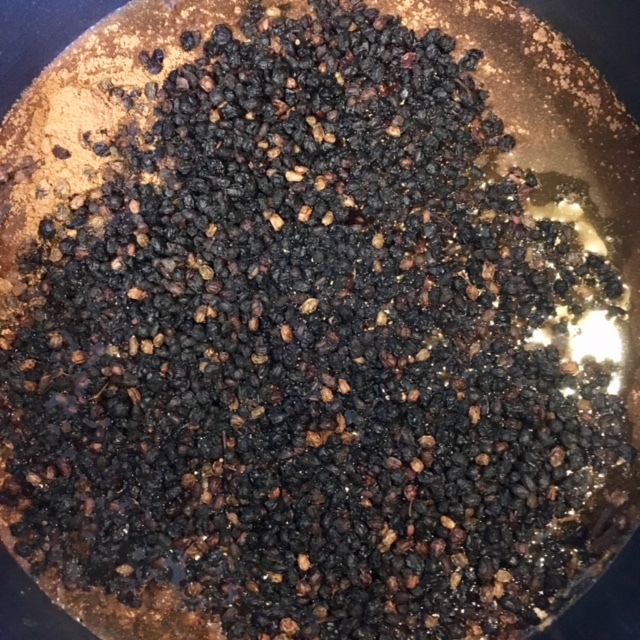 So for us, it made more sense to purchase the dried berries on Amazon, and make it myself. I got a whole pound of European elderberries (which are black elderberries), for about $26. You also need a cup of honey for the recipe, so that gets a little pricey because you want to use a high quality, raw honey. But still, it's worth it for the amount you get. I used the Wellness Mama recipe, which is pretty popular, and SUPER simple. Basically, you add the elderberries to water with some spices, and simmer it until it reduces. Then you strain it, let it cool a little, add your honey and VIOLA! Elderberry syrup. I used ginger, cinnamon, and whole cloves to flavor mine, and I really liked what the spices added to the final result. What I did not expect when I started this little syrup project, was the SMELL. I read up a lot before I made it, and no one warned me about the smell. Let me just be honest when I say, that the boiling berries smelled so gross, that my three year old was literally gagging and asked to leave the kitchen! I was so turned off by the smell I really thought there was going to be no way for me to actually take the syrup once it was made. BUT LET ME ASSURE YOU, once you add the honey, and it cools, it's actually pleasant and quite sweet. I am even able to sneak it into my daughter's orange juice and she hasn't complained at all (which is really saying something!) I have been giving her a half teaspoon per day, and I have been taking a full teaspoon. This is basically a preventative dose, and if you come down with a cold, you can take a larger dose a few times a day to help stem the tide of the symptoms. I was pleasantly surprised that the batch was also big enough to share. My mom wanted some for immunity and my mother-in-law is trying some as well because I read it can be good for nerve health. These powerful little berries really pack a good punch, and so far, I am really enjoying having the syrup on hand. If you are thinking of making your own, this is the type of homeopathic remedy that seems to have more benefits than drawbacks, and is safe for the whole family. Of course, this blog is not medical advice, and you should always consult a doctor if you have medical questions/conditions. And be sure to do your research--some elderberry varieties are not safe for consumption.